State environmental officials have rejected a plan to allow piles of petroleum coke to be stored at a location along the Detroit River. Pet coke piles on the Detroit River, before they were relocated. Pet coke is an oil refinery by-product that’s used as an industrial fuel. The state Department of Environmental Quality said the proposal by Detroit Bulk Storage did not address problems with blowing black dust. Complaints about dust plumes were among the reasons why Detroit ordered the open piles of pet coke removed from a riverfront location in the city. The new proposal would have moved the pet coke to a riverfront spot in nearby River Rouge and included covering the piles with tarps if strong winds caused dust clouds. The DEQ said that’s not enough. At a minimum, the agency said the pet coke would have to be put into some sort of enclosure. Regulators say the company, Detroit Bulk Storage, can submit a new proposal. A lawyer for Detroit Bulk Storage told The Associated Press the company is reviewing its options. 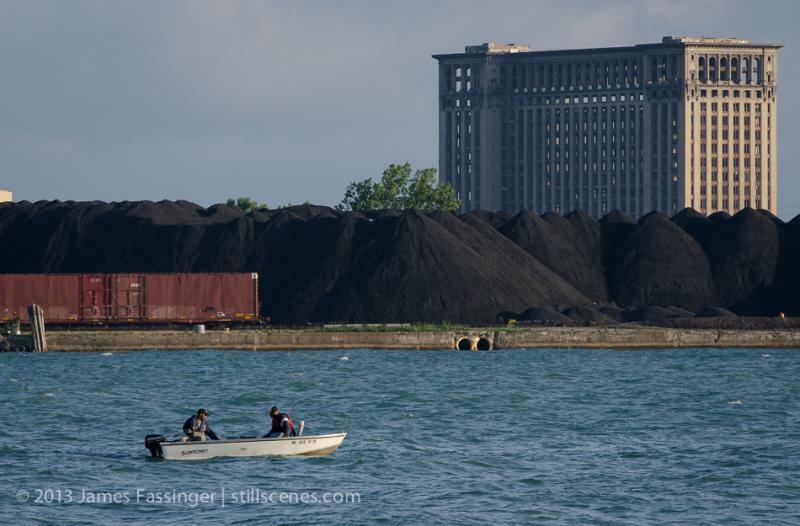 Are Detroit's pet coke piles coming back? A meeting of the Detroit Board of Zoning Appeals yesterday resulted in some verbal firework, some confusion, and much scrutiny. That's because the hearing involved a request from the company that was home to massive piles of petroleum coke last summer. The petroleum coke — or pet coke, as it’s called — is a byproduct of refining heavy crude oil brought in by pipeline from Alberta. The people who had to live near four-story piles of pet coke, and breathe in clouds of pet coke dust last year before the stuff was moved out, are now watching to see if Detroit Bulk Storage is trying to get pet coke back on the Detroit Riverfront. Dave Battagello has been tracking this story for The Windsor Star.